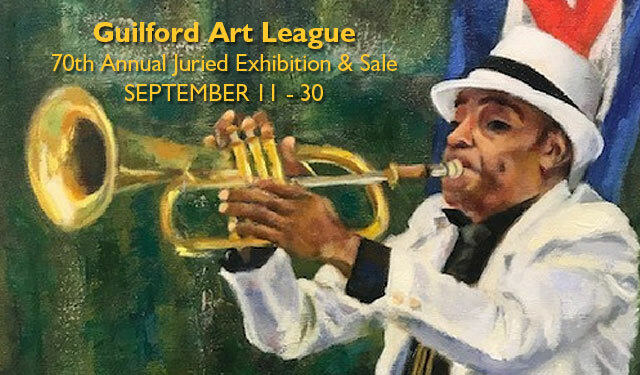 The Guilford Art League was founded in 1947 by a small group of local artists. Their mission continues to promote and stimulate interest in the visual arts. This juried show for Connecticut artists is jurored by Robert Brennan from Easton, CT, whose work as a teacher and artist spans 60 years. Gallery entry is free and open to all. Robert Brennan’s career as an artist spans more than sixty years. Over the years his work as a teacher and artist has explored both traditional genres as well as experimental abstraction. His interest is eclectic and recognizes the great diversity of style, subject, media, and expressive goals possible in the visual arts. His shaped canvas construction “Virgin Landscape” was recognized for originality and expressive quality, winning first prize in the Art of the Northeast USA exhibit sponsored by the Silvermine Guild of New Canaan, CT by juror Charlotta Kotik, curator of contemporary art at the Brooklyn Museum. His “White Series” was selected by art critic Barbara McAdam for an artist’s solo exhibit at the New Art Center in New York City. Also from the White Series, his construction entitled “Variations” was selected for inclusion in the highly competitive Veridian Artists annual competition in New York City. Works from the construction series are represented in private collections in CT and New York City. Mr. Brennan lives in East, CT. His work has been shown in New England and New York City. He received his BA at Southern Connecticut University and his MA from Columbia University, where he also studied in a TC doctoral program.